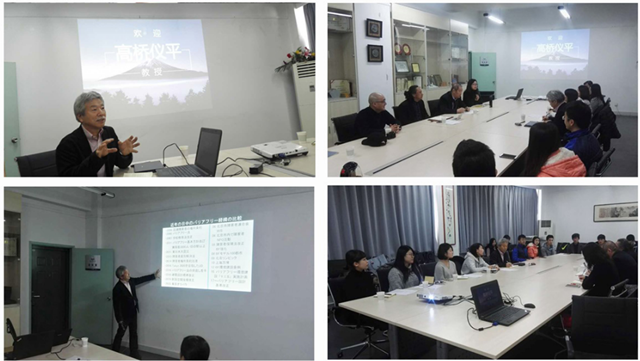 In February 23, 2017, professor Takahashi Yoshihira from Faculty of Human Life Design, Toyo University, visited School of Art and Design, Beijing Institute of Technology and had a talk and academic exchange with teachers and students. Toyo University and our school has signed an intercollegiate cooperation agreement. During the talks, we both discussed specific co-operation, including workshop, undergraduate exchange, joint postgraduate training and scientific research cooperation, which also has wide academic exchanges and cooperation in the future. We decided to promote our cooperation as soon as possible to reach specific cooperation rules on the basis of the school cooperation agreement framework. After the talks, Professor Takahashi gave a small academic lecture for teachers and some graduate students, introducing the latest developments in the construction of barrier free cities in Japan and the barrier free design concept of Tokyo Olympic venues. After the lecture, Professor Takahashi answered the questions from students, and points out that China and Japan are faced with the development trend of aging of population. So, whether we can develop the idea of barrier free facilities and environmental construction with a long-term view, is very important for the city environment.